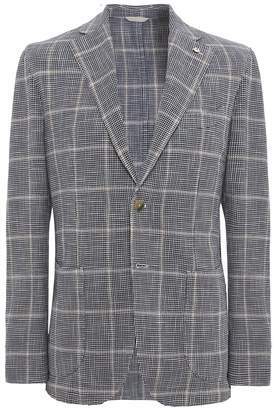 Smarten up your casual attire with the LBM 1911 houndstooth check jacket. Expertly tailored using a cotton and silk blend cloth, the jacket has been designed unstructured for a more relaxed approach. Featuring a two button fastening, notch lapels and stacked button cuffs, whilst the large bellow pockets further enhance its laid-back qualities. Complete with a bold houndstooth check pattern throughout, the LBM jacket is sure to become your go-to for summertime occasions.